Tesla is now testing its Semi truck in the wild and public roads and there is a new 8-second video clip of that test. If you remember we got the first look of Tesla's Semi truck in the November of 2017. This electric truck promised to have a range of 500 miles on a single charge and cost between 150,000 to 180,000 USD. Not surprisingly growing number of orders started coming in. Tesla had to rush and now it's at a point where the company is testing the Semi in California's public roads. Here is what the automotive media thinks about the truck. Ars Technica's Timothy Lee writes that "Publicity photos of the Tesla Semi in November showed the truck without side mirrors. Tesla is developing a system of cameras that will supposedly give the driver a better view of the truck's surroundings than is possible with mirrors. But the truck spotted on Santa Clara streets had them—presumably because the law requires it." Jalopnik's Ryan Felton notices how quiet the Semi truck is. "A fun point here is the whoosh of the tractor as it drives past the camera. It really is quiet," Felton writes. 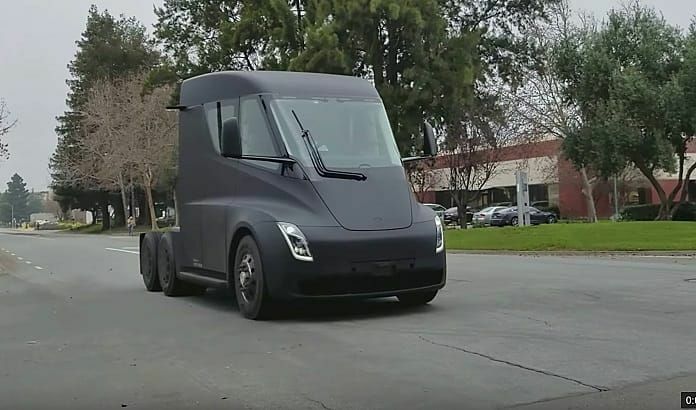 CNET's Andrew Krok notes that this is the best look of the Semi that hasn't come from Tesla. "Brandon Camargo published a video of the Tesla Semi on his YouTube page. It's just 8 seconds, but it's perhaps the best look at Tesla's cab that hasn't come from Tesla itself. The video was shot in Santa Clarita, California, to the north and west of Los Angeles," Andrew writes. Note that this video of the Semi is published almost a week ago and just today it's being picked up by the media. Tesla is receiving good amount of orders for its Semi truck and here is the list of 19 companies that have ordered 375 Tesla Semi trucks so far. According to Teslarati Tesla's prototype truck in the video has a USDOT identification number of 2298288, "which means it might not be just a test vehicle, but one that is also being used to move materials around as part of Tesla's own fleet," writes Forbes. Isn't it weird when a huge truck makes so little sound? Let us know your impression of this truck's video int he comments section below please, for discussion. 4 reasons I wouldn't buy Tesa Semi yet. 1 At this point it still is not cost effective. 2 our grid is already overburdened. That much extra power would cause major issues. 3 I have yet to see anything from a battery that makes me want to rely on one with 80,000lbs. at highway speeds. 4 They will drive electricity costs up. For me it's yes. 1 the cost is comparable to diesel trucks. 2 These were not made for over the road. Dude even said himself they are for local the reason for the 500 mile range. 3 it's not gonna over load the grid. Teslas is way bigger than you think talked to a guy said his home energy bill only raised about $100 a month living in denver. The future is here and now.